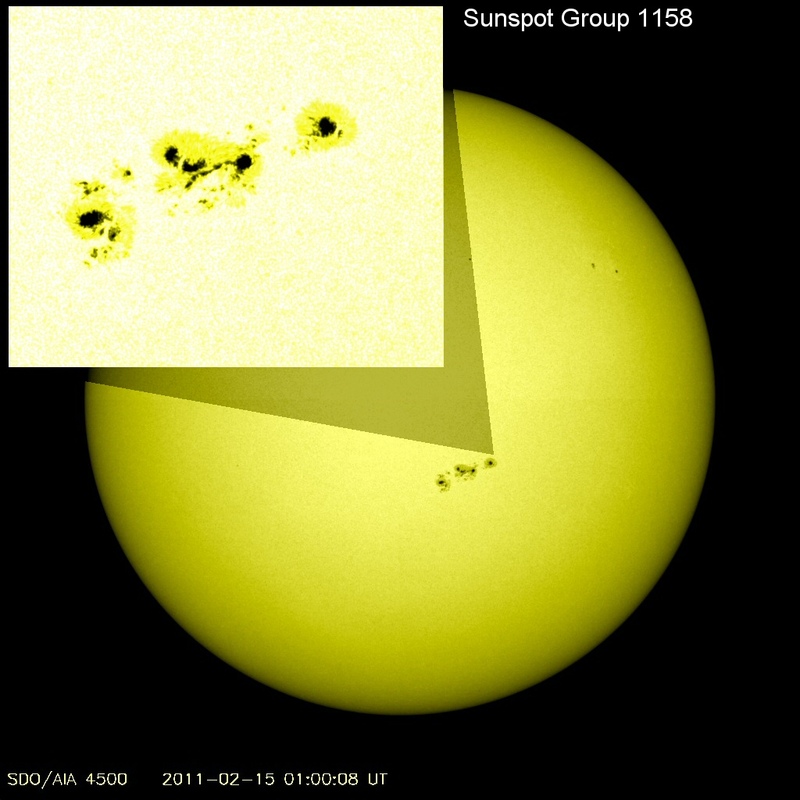 Sunspot group 1158 produces an X class solar flare | Watts Up With That? Solar expert Dr. Leif Svalgaard says the last X class flare was Dec 13th, 2006. The flare today is the first Solar Cycle 24 flare reaching X class level. Lookout for auroras in the next couple of days. Flare classifications: Each category for x-ray flares has nine subdivisions ranging from, e.g., C1 to C9, M1 to M9, and X1 to X9. The first SC24 X-class flare. As far as I know, the last X-flare was on Dec. 13, 2006. Will not happen until the CME hits us in a couple of days. What does “X” class mean, the largest flare possible? Anthony, that’s a fine graphic of the Sun and its spots. And kudos to Lief for predicting it would be an X-class flare before anyone else. I watched all 5 parts last night and was blown away. In my humble opinion, this is HUGE! .. It would really be swell to read comments on this blog about this documentary. I would love to read opinions about it from people that comment here, people that I respect. Flares are huge explosions on the sun that emit a broad band of electromagnetic energy from RF through visible light up to x-rays. They are classified by the amount of x-ray energy detected on the GOES X-RAY sensors. But you can see the flare here in the microwave spectrum (17GHz), from the Japanese radioheliograph at Nobeyama. (The only one of its kind in the world). The frames are 10 minutes apart. The flare starts around 0150 UTC. 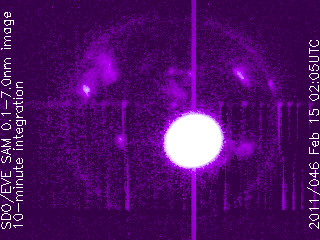 The “X” pattern that shows up on the flare is overmodulation caused by the large radiation pulse received at the Nobeyama antenna farm (84 dishes, each 80cm in diameter). It’s the first one in months? In an April 2, 2009 article, retired U.S. Navy physicist and engineer Jame A. Marusek writes: “The sun has gone very quiet as it transitions to Solar Cycle 24. “(The sun) might (1) revert to the old solar cycles or (2) the sun might go even quieter into a “Dalton Minimum” or a Grand Minima such as the “Maunder Minimum”. It is still a little early to predict which way it will swing. Each of these two possibilities holds a great threat to our nation. “If the sun becomes quieter than the old solar cycles, producing more than 1028 spotless days, then we might slip into a Dalton Minimum or maybe even a Grand Minima such as the Maunder Minimum. This solar state will last for decades. Several solar scientist have predicted this will begin in Solar Cycle 25, about a decade from now. But a few have predicted this will occur now in Solar Cycle 24. “A quiet sun will cause temperatures globally to take a nose-dive. We will experience temperatures that we have not seen in over 200 years, during the time of the early pioneers. The other possibility Marusek sees is a quiet sun marked with explosive flares capable of returning our electronic society off for years. Not on spaceweather.com yet. Also, I like that site a lot, but they really blew it. They reported on an M-6 flare popping, but their risk for an X-class was only at 0.05 or 5% when this X class flare went off, which is their default low-risk rating. They need to do a better job at assigning risk if they want to benefit space businesses. I think when you have a growing sunspot and an M-6 flare, the X-flare risk should be a lot higher. Certainly, the current fluctuations in the Earth’s magnetosphere are also problematic. The ongoing “reversal” of the magnetic field makes for an interesting mosaic of potential sites for aurorae as well as other field effects. The coupling effect of incoming particles with a S orientation is what makes the difference normally. As field strengths fluctuate locally and new poles form and dissipate (with concurrent variations in field strength and orientation) highly variable effects will occur. Not to worry. The reversal of the Earth’s field takes thousands of years to play out, so are not interesting for the current situation. This flare is capable of a Forbush decrease. Happy Valentine’s Day from our Sun! Looks like we just got our picture taken! Maybe some 6M/10M activity? Does anyone know if the sun produced a gigantic sunspot group when Tambora erupted in April, 1815? Just something I’ve seen tossed around, don’t know if it actually happened and not suggesting any correlations. We know that when the sun is active, both its magnetosphere and the relative proportion of UV in its total irradience are higher. While the magnetosphere effect — particularly with respect to Dr. Svensmark’s theory — is under investigation, is anyone looking at actual UV effects reaching the planet’s surface? We know that UV penetrates somewhat deeper into the oceans than visible, so if both increased UV and Svensmark-style reduction in cloud formation were results of increased solar activity, there would be two (physically unrelated) phenomena with mutually reinforcing climatic effects. A couple of points, Andrew. First there’s no limit to X flare magnitude, for instance the largest flare during cycle 23 reached a revised magnitude of X45. Secondly region 1158 is really region 11158. Historically region 1158 was observed over 30 years ago (if my memory serves me right). The reason NOAA/SWPC is using only a 4 digit number is that it was too much trouble changing their data formats to accept 5 digit numbers. So 1158 is basically an internal SWPC number, others should use 11158. I don’t know who predicted a flare of this magnitude first. My prediction of a major flare was publicized 6 hours before the M6 flare on Feb.13. I would assume several other predictions were available as well. Would that mean that the Sun emits so much flare energy per cycle, but since it’s been rather quiet it has to pop off that energy in larger bursts? So what is the relevance of all this? Are you disputing basic CO2 physics? What does any of the this have to do with the observed changes within our atmosphere and biosphere these past decades and the clear explanation that the consensus climatology community has set forward, along with the cornucopia of incoming evidence? Short summary movies of this flare as observed by SDO can be found here. Scrolling down this page, one finds auto-generated movies from many of the SDO/AIA channels. At the top of the page is a “running difference” movie, where each frame in the movie is the difference between two successive images from (in this case) the SDO/AIA 211Å channel. In general, such movies are used to highlight changes from one image to the next. Here, the apparent outward-directed “blast wave” initiated by the flare, as well as the resulting oscillations of the coronal loops surrounding the flare, become more evident when viewed as running differences than when viewing the regular movie from the 211Å channel. Interesting that solar flux has shot up to ~113, which is ~ 30 up on previous rotation. How long does aurora last after a event this big? Will it last long enough for most of the northern hemisphere to be able to see it? ~24 hours? What parameters decide how far south we can see aurora if not the size of the flare? I remember seeing fantastic aurora around 60 degrees in the early 90’s. Hoping to show my kids this one. I was willing to give you the benefit of the doubt that you are new to WUWT as it is clearly stated that this blog is a “Commentary on puzzling things in life, nature, science, weather, climate change, technology, and recent news.”, but your blog would indicate otherwise. By my count this story meets all those criteria. We are also very fortunate to have several exceptional posters who have credentials in solar physics beyond reproach as evidenced by many of the comments in this thread. The vast majority here do not dispute basic CO2 physics but question the severity of impact attributed to it and understand that the scenarios presented for the next 5, 10, 50, 100 years rely on a tenuous assumption that CO2 is capable of amplifying the effects of other greenhouse gasses leading to runaway catastrophic thermageddon. As many posters who have tirelessly contributed to the vast repository of knowledge that WUWT represents have shown the consensus is hardly that and the cornucopia of observations do not match the theory and are tainted by poor quality control. What is relevant is the work of Dr. Henrik Svensmark who has been working on establishing the link between solar strength and galactic cosmic radiation that reaches the earth. I recommend you read his book, The Chilling Stars: A New Theory of Climate Change and research his efforts to validate that theory at CERN with the CLOUD project. I hope you really believe in “honest examination of today’s deeper challenges.” as should become apparent with even infrequent browsing of the daily topics presented here that only one side allows free and open discussion on topics, including the ones that challenge their worldviews. As many of us have come to understand true enlightenment requires admitting your mistakes and allowing all voices to be heard even the ones you disagree with. If you can’t admit that the gatekeepers of the consensus have done everything in their power to prevent an honest examination of the theory and observations then you may as well move on and keep lying to yourself. I watched all 5 parts last night and was blown away. In my humble opinion, this is HUGE! .. It would really be swell to read comments on this blog about this documentary. I would love to read opinions about it from people that comment on hear, people that I respect. It is a good exposition of an interesting and plausible theory. It is a good example of the abuse of the peer review system. It demonstrates how the real scientific method is applied by genuine scientists. It shows, first hand, the arogance, pomposity and intolerance of some in the scientific establishment. It should be compulsary viewing for any schoolchild shown the “Inconvenient Truth”. They could then be left to draw their own conclusions. anyone looking at actual UV effects reaching the planet’s surface? The variation of that UV is so small that energetically is has no measurable effect. I would assume several other predictions were available as well. Whenever you have an active region of the complexity of 1158, strong flares are a given. I don’t think there is any such ‘rule’. On a quiet sun an active region perhaps has a better chance to grow [if it is so] undisturbed of other activity. But this is conjecture. We haven’t seen the aurora from this flare yet. A good-sized magnetic storm takes about a day to play out. James Mayo (12:45 am) – well said. When CO2 was mentioned by the challenged one, my first thought was that he’d posted on the wrong page, but with your excellent attempt at enlightenment, I suspect we’ll either get silence, or troll-type rubbish back. Anthony has shown me a bit of grace a time or two.. as my posts are either inquisitive, or humorous jibes at those whom believe that the “science is settled”. So at the risk of being justly moderated. I will weigh in. It is my .. ardent opinion.. that the demonstration of solar physics here, and the subsequent known and unknown effect it will have on the earth , and to find the need to ask if it is indeed “relevant” is the equal of asking a man whose head is stuck in a bucket of water.. if oxygen is indeed relevant. Perhaps Mr Gore could assist you in this comparative.. if he is ever able to get own head out of the bucket. I already knew about Svensmark’s GCR cloud regulation hypothesis but this film he made about it is wonderful and well worth watching. Hearing him describe the hostility he met from the CAGW community and how shocking it was to him is a great testimony to how climate scientists convinced of and/or perpetuating the CO2 myth are peddling ideological dogma not science. Those folks are so far off the path of science it’s doubtful they’ll ever find their way back. Video replay of the X2.2 flare in UV 1700A light”. Note that there were several smaller flares, probably C-class, before and after the main event. Since X is the top class they can exceed X9. X12, X20 are possible . . . ouch. Douglas, I wonder if we will be able to see the aurora through the snow flakes? Lostine forecast is for mostly cloudy and snowy over the next 6 to 7 days. Who cares. Whether this has relevance to weather or climate is a non issue. This is real science. There is a very interesting natural phenomenon happening right now and with the links provided by the great people at this blog we can watch it happen almost right before our eyes. Not only that but we can learn something about it through the posts of some of the worlds most knowledgeable people on this topic. Sometimes we need to stop arguing and just observe, watching these solar flare videos is pretty cool, and the possibility that we will have some auroras to watch is even better. I for one am very thankful that Anthony posts stuff like this and gives a forum for these discussions. I have found eruptions occur at short term solar forced uplifts in temperature after colder periods, with bigger events typically at bigger temp` differentials. More often the uplift would be due an increase in the solar wind speed from coronal holes rather than sunspot flares. Watch from mid May this year. BTW, (& this is general) don’t feed the trolls – ignore them, and they crawl back under the bridge. Pamela- I know -Im hoping for a Snow(rain) Shadow effect for at leat a couple of hours near dawn…. Full moon doesn’t help either…. JM: If you can’t admit that the gatekeepers of the consensus have done everything in their power to prevent an honest examination of the theory and observations then you may as well move on and keep lying to yourself. Hmmm, and you believe WUWT has always been a straight shooter? SB: It is my .. ardent opinion.. that the demonstration of solar physics here, and the subsequent known and unknown effect it will have on the earth , and to find the need to ask if it is indeed “relevant” is the equal of asking a man whose head is stuck in a bucket of water.. if oxygen is indeed relevant. MR: Who cares. Whether this has relevance to weather or climate is a non issue. This is real science. There is a very interesting natural phenomenon happening right now and with the links provided by the great people at this blog we can watch it happen almost right before our eyes. That’s fair enough, guess I was jumping to a conclusion that you’re trying to explain away our witnessed global warming by blaming it on a sun that have been at a minimum. Although I agree it will be interesting watching this year unfold and witness what the sun does. Maybe someone has a land-based web cam specific to aurora watching we can take advantage of. sorry should have added quotation marks. I know little about predicting auroras. Tonight (15th)? Tomorrow (16th)? I’d like to alert people to be looking but I don’t know when to tell them to look. Is this just a “dead cat bounce” off the minimum? It was, after all, just barely an X-flare at 2.2. Didn’t 22 & 23 produce a fusillade of X10 flares in rapid succession? > Isn’t this just a “dead cat bounce” off the minimum? It may be just be a crumb. But when you’ve been starving for solar activity for over a year, it seems like a feast. I do believe that is a curse . . . boring is so much more safe. So, if we believe the Svensmark paper (which is quite persuasive, thanks to whoever posted that link as it amplifies on the old Lassen and F-Christiansen paper(s) I read back in the 90’s back when the MWP and LIA hadn’t been “erased” by MBH) then the arrival of the flux burst and accompanying solar wind/ejecta from the flare should be accompanied, with a rather short lag, by a visible diminishment in average low level clouds. One of the nice things about the “GCRs modulated by solar events in general affect cloud formation and hence insolation” hypothesis is that it is predictive. Hence there should be a clear signature in the satellite data over the next four to six weeks, especially against the background of remarkably low solar activity up to now. It’s true that no single event will be persuasive, but by emphasizing that this is a prediction and not just a possible artifact of past data and accumulating a series of future events, one should be able to reduce any doubt that the events are causally correlated to near zero. And of course now we can directly measure the cloud coverage and compare it to at least 30 year running seasonally adjusted averages, as well as look for the correlated derivatives. Observing the associated thermal spike will be more difficult, but even that might be possible. by emphasizing that this is a prediction and not just a possible artifact of past data and accumulating a series of future events, one should be able to reduce any doubt that the events are causally correlated to near zero. Then, since theories stand or fall on their predictions, if the expected signal dos not arise, you’ll advocate scrapping the theory. The last real good one I saw was during the preceding solar cycle. In lower Wisconsin the sub storm was so strong it filled the sky. Above my head it went at least 30 degrees into the southern part of the sky. At one point during the stunning display the sky turned as red as blood. I felt like God could bring his finger down and squish me like a bug. Watch how the magnetic flux [white and black for the opposite magnetic polarities] ‘bubbles up’ from below in what looks like a very mixed state, i.e. lots of little white and black elements coming up, then separating by polarity, with white joining up with white already there and the same for black. Watch the elements move and rotate and get twisted up, thus providing the energy that will power the flare. Also, watch how eventually large, mature spots are eroded along the edge by the unceasing, vigorous overturning convection of the solar photospheric plasma. Yep, though I haven’t actually looked at Svensmark’s theory in the last year and cannot say that it is predictive of this event. From what he was publishing a year ago, I can say that he has an excellent understanding of scientific method and submits to it righteously. You have to give the man credit. He is the only climate scientist who has put forth genuine hypotheses that go beyond the 19th century hypotheses about the behavior of CO2 in the atmosphere. He might give us a genuine scientific account of cloud forcings. Leif, we don’t scrap an entire theory on the basis of one false prediction, but maybe scrap one hypothesis belonging to that theory, something that you know I am sure. February, non-smoothed (which I use) average at the moment is 52. You may not need the L&P ‘invisibles’ to rescue your 78 Rmax. I am sticking to my long term held view for the non-smoothed monthly SSN hitting or surpassing 80. And my point wasn’t that if it happens it verifies it or if it doesn’t happen it falsifies it all at once (See: It’s true that no single event will be persuasive… above, and I apologize if I wasn’t clear) it was that if one expects it on the basis of a hypothesis and it happens, it is reasonable to increase one’s degree of belief in the hypothesis and if it doesn’t happen it is equally reasonable to decrease it. Over time, observing a series of predictions that succeed at a rate that rises above the statistical level of noise (the natural fluctuations in cloud cover under the null hypothesis that “solar state is statistically independent of cloud cover”) can reduce the p-value for the null hypothesis to where it is no longer a reasonable alternative. To be precise, as opposed to sloppy. Although arguably, the analysis of past data has already done that (as Svensmark shows) but the response on RealClimate was predictably enough to try to insinuate that he faked the data or otherwise cooked everything up so that they could continue to ignore the strong correlations he shows. The real point is, as noted that this is a non-nonsense falsifiable, predictive hypothesis of events on relatively short timescales — there is no reason to think that a high GCR level today is going to affect cloud formation four weeks from now; the charged particle cascades and aerosol formation all seem to be real-time events and the particulates formed (probably) have a moderate half-life in the lower atmosphere. Thus every major flare, especially against a generally quiet background, provides an immediate opportunity to test the hypothesis, even though sure, it will probably require many such tests/events for the signal to rise unambiguously above the noise — or not. CO_2, on the other hand, isn’t falsifiable as far as I can tell — negative or null results are simply reinterpreted as support for the theory. Unusually hot? AGW. Unusually cold? AGW again! Unusually stormy? You got it — AGW. For a meaning of the word “unusually” that as far as I can tell means “usually”, at least on a millennial timescale — unless one short-centers a PCA of 112 proxies in a way that amplifies bristlecone pines as erasers of the MWP and LIA, so that global temperature was basically flat until 1800. My major problem with the AGW hypothesis is that so far its primary support has been appallingly bad science with hypotheses galore stated as if they were bald fact, generally with enormous political fanfare. I hate it when physics research (which is, fundamentally, what it is) starts to look like medical research with confirmation bias, cherrypicking, and horrendously poor statistical methodology the order of the day. Perhaps is it correct, perhaps not, but the correct statement concerning our knowledge of whether or not it is correct is “we don’t know”, just as the correct statement about just how warm it is today, on average, compared to the non-anthropogenically forced past is “well within 2 sigma” of the mean temperature over the Holocene. So sure, I like it when I see strong correlations between things like solar state and global climate, especially over very long timescales and relatively short timescales — Svensmark shows both. And sure — if a series of predictions based on the theory fails, so that the null hypothesis of “no correlation/no effect” remains a reasonable alternative, of course I’d reject (or rather, fail to accept) the theory. Isn’t that the whole point? What will it take to reject CO_2 and AGW? Multiple decades where temperatures fail to rise (although CO_2 continues to rise) obviously hasn’t been enough. If we are entering a Mauder Minimum (or simply if the current maximum is very weak) then any fall in average temperature will be attributed to volcanos, a weak variation in forcing due to solar state, transient shifts in ocean currents or the PDO that mask the inevitable progression of AGW for ten, twenty, thirty years. It is easy to see what the real problem is. I love to build theoretical/statistical models and have spent way too much time doing so, fitting curves to data to try to ferret out some numerology. One can clearly take the last 200 years of moderately accurate global average temperature and fit it by using atmospheric CO_2 as the primary variable — it isn’t quite a linear fit, but there is clearly a monotonic trend to both. Of course temperature hasn’t climbed monotonically or smoothly, while CO_2 has increased almost exponentially smoothly with lovely predictable annual modulation, so you need something to explain the rather strong fluctuations in temperature, multi-decadal deviations in both directions from monotonic increase . You therefore find something that might do so — solar variations, atmospheric sulphates, nuclear testing — that has the pattern of the variations and use it as a relatively small/secondary correction and voila! A decent fit. Of course the problem occurs when one tries to apply the fit over the last 1000 years to the actual probable average temperature including MWP and LIA (as opposed to the MBH hockey stick). Suddenly one is forced to confront the fact that in the MWP there were no atmospheric sulphates worth mentioning and nuclear bombs hadn’t been invented and the anthropogenic CO_2 levels were basically zero — but damn, it was at the very least nearly as warm as it is today if not warmer. Solar variations, however, were around back then, and were strongly correlated with the LIA as well, which is very difficult to explain with a dip in anthropogenic CO_2 or sulphur aerosols. Then one is very naturally tempted to at least try to invert the statistical fit. What if it were solar variation that were the primary driver of global climate and CO_2 the minor modifier? Simply eyeballing the data one can see that this would work, and work damn well. Solar with a CO_2 modulator would work over the last 200 years at least as well as CO_2 with solar as a modulator — both would result in good fits (as is so often the case with nonlinear regression, what one gets even for a two component model depends on where one starts!) Over the Holocene, however, CO_2 as the primary modulator fails badly, obviously — so much so that it is perfectly clear that it can never be taken seriously as a global hypothesis until the primary drivers that determine global climate are accounted for and their background subtracted which we cannot do until we understand them which we don’t. Solar/GCR with CO_2 as a modulator (or neglecting CO_2 entirely) appears to work at least tolerably well over decadal scales (Svensmark), century scales (Lassen and Friis-Christensen, Solanki and Fligge), thousand year timescales across the Holocene (Bond et. al.) and there is at least a strong correlation over hundred million year timescales (Svensmark, again). Whether or not Svensmark’s particular mechanism is correct, this correlation between solar state as evidenced by e.g. Be10 and C14 levels and various climate proxies is (in my opinion) almost certainly real — it has been reported by many authors and as far as I know contradicted by none. And it isn’t really surprising — the Sun is hardly the constant, quiet, passive entity that the hockey stick crowd make it out to be, it is a vibrant (or perhaps “vibrating”:-), dynamic, variable object that we are just barely starting to understand. It is Rmax=72, but you have misunderstood L&P. The Rmax=72 corresponds to F10.7 ~120, and that is the real prediction. [e.g. Schatten does F10.7; to make things easier to compare and since most people report their prediction as SSN we did too]. The prediction is based on the magnetic field and so predicts magnetic fields [of which F10.7 is an excellent proxy]. At the time it was not known [although there were hints – e.g. the Maunder Minimum] that the visibility of sunspots could vary much more than the magnetic field, so everybody assumed a constant relationship between F10.7 and SSN. We now know that this relationship may not be constant and will have to adapt to that. it is reasonable to increase one’s degree of belief in the hypothesis and if it doesn’t happen it is equally reasonable to decrease it. That is the way you should have said it. Good that you have come around to that. this correlation between solar state as evidenced by e.g. Be10 and C14 levels and various climate proxies is (in my opinion) almost certainly real — it has been reported by many authors and as far as I know contradicted by none. http://arxiv.org/abs/1004.2675?context=physics so there is some circularity in the argument. Wow , this is exciting! I first started following solar data (thx to WUWT) in 2007, after the start of the extended minimum. So this the first time in the short life of my newest hobby that I’ve seen the 10.7cm radio flux go above 100. Some people might reckon that tracking 11 year solar cycles is sort of like watching paint dry, but I think it’s fascinating. I obsessively check the stats like a baseball fan burying his head in box scores after every game. What is the normal odds of a flare producing an aurora, so those of us not in the know can decide how psyched to get? Ulric Lyons, I was really impressed with your comments about solar wind last summer. Hot, dry wind blowing Eastbound and I couldn’t help but say to myself its like its coming straight from the sun like Ulric said.